ماجدی, حمید, زبردست, اسفندیار, مجربی کرمانی, بهاره. (1396). بررسی متغیرهای مؤثر در رشد شهری ارومیه با استفاده از مدل لاجیستیک رگرسیون. معماری و شهرسازی آرمان شهر, 10(21), 377-392. حمید ماجدی; اسفندیار زبردست; بهاره مجربی کرمانی. "بررسی متغیرهای مؤثر در رشد شهری ارومیه با استفاده از مدل لاجیستیک رگرسیون". معماری و شهرسازی آرمان شهر, 10, 21, 1396, 377-392. ماجدی, حمید, زبردست, اسفندیار, مجربی کرمانی, بهاره. (1396). 'بررسی متغیرهای مؤثر در رشد شهری ارومیه با استفاده از مدل لاجیستیک رگرسیون', معماری و شهرسازی آرمان شهر, 10(21), pp. 377-392. ماجدی, حمید, زبردست, اسفندیار, مجربی کرمانی, بهاره. بررسی متغیرهای مؤثر در رشد شهری ارومیه با استفاده از مدل لاجیستیک رگرسیون. معماری و شهرسازی آرمان شهر, 1396; 10(21): 377-392. 2استاد برنامه ریزی شهری، دانشکده شهرسازی، پردیس هنرهای زیبا، دانشگاه تهران، تهران، ایران. 3استادیار شهرسازی، دانشکده هنر و معماری، دانشگاه آزاد اسلامی واحد تهران شرق، تهران، ایران. اگرچه رشد شهری پدیده ای مرسوم است، اما الگوها و عوامل محرک آن نسبتاً نامعلوم است و مجموعه عوامل جامعی که بتوانند فرآیند رشد شهری را شرح دهند، ب هدلیل منحصر به فرد بودن خصوصیات شهرها وجود ندارد. برای ارزیابی نتایج برنامه ریزی های انجام شده در رشد شهری و پیش بینی وضعیت محدوده شهرها و دیگر تغییرات کاربری اراضی، برنامه ریزان شهری احتیاج به تحلیل رشد شهری به صورت عملی دارند. این مقاله بر درک فضایی زمانی رشد شهری در ارومیه به عنوان نمونه ای از شهرهای بزرگ ایران تمرکز می کند که رشد کالبدی آن سبب الحاق اراضی پیرامونی به شهر، ایجاد و توسعه سکونت گاه های نابه سامان، حاشیه نشینی و گسترش بی رویه و بی برنامه طی دهه های اخیر شده و درنتیجه به در نظر گرفتن سیاست توسعه ناپیوسته شهر در طرح جامع شهر ارومیه منجر شده است. در این راستا پس از بیان مفاهیم پایه و پیشینه تحقیق درباره رشد شهری، مدلی مفهومی برای تحلیل رشد شهر ارومیه ارائه می کند که در برگیرنده متغیرهای تحلیل رشد شهر ارومیه می باشد. سپس با بررسی انواع روش های مدلسازی رشد شهری، به انتخاب رویکرد مدلسازی (لاجیستیک رگرسیون) برای تحلیل رشد شهری می پردازد. در مرحله بعد با بررسی روند توسعه تاریخی شهر ارومیه، تحلیل رشد شهر ارومیه را با استفاده از مدلسازی لاجیستیک رگرسیون جهت شناخت عوامل محرک رشد شهری و تأثیر این عوامل در رشد شهر ارومیه انجام می دهد و مناطق مسکونی و راه ها را به عنوان مهم ترین عوامل مؤثر در الگوی رشد شهر ارومیه شناسایی می کند و نهایتاً بیان می کند که در برنامه ریزی آینده شهر ارومیه، الگوی قرارگیری مناطق مسکونی و اثر متقابل کاربری زمین/ حمل و نقل، اهمیت خاصی خواهد داشت. Allen, J. & Lu, K. (2003). Modeling and Prediction of Future Urban Growth in the Charleston Region of South Carolina: A GIS-Based Integrated Approach. Conservation Ecology, 8, 2. Batisani, N. & Yarnal, B. (2009). Urban Expansion in Centre County, Pennsylvania: Spatial Dynamics and Landscape Transformations. Applied Geography. 29, 235–249. Batty, M. & Longley, P. (1994). Fractal Cities: a Geometry of Form and Function. San Diego: Academic Press. Braimoh, A. K. & Onishi, T. (2006). Spatial Determinants of Urban Land Use Change in Lagos, Nigeria. 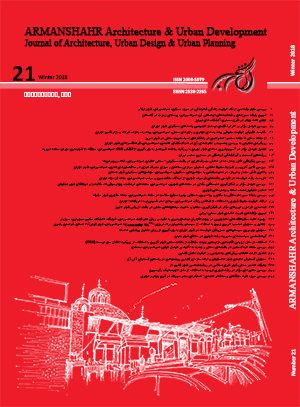 AMS Online Journals, 8, 21. Cetin, M. & Demirel, H. (2010). Modelling and Simulation of Urban Dynamics. Fresenius Environmental Bulletin, 9, 10A. Cheng, J. & Masser, I. (2003). Urban Growth Pattern Modeling: A Case Study of Wuhan City, PR China. Landscape and Urban Planning, 62, 199-217. Cheng, J. (2003). Modelling Spatial & Temporal Urban Growth. Doctoral Dissertation, Faculty of Geographical Sciences, Utrecht University. Clarke, K. C. & Gaydos, L. J. (1998). Loose-coupling a CA Model and GIS: Long-term Urban Growth Prediction for San Franciso and Washington/Baltimore. International Journal of Geographical Information Science, 12 (7), 699-714. Clarke, K. C., Hoppen, S. & Gaydos, L. (1997). A Self-modifying Cellular Automaton Model of Historical Urbanization in the San Francisco Bay Area. Environment and Planning B: Planning and Design, 24 (2), 247–261. Dendoncker, N., Bogaert, P. & Rounsevell, M. (2007). Spatial Logistic Regression Models to Analyse the Role of Neighbourhood Variables in Land Use Distributions in Belgium. Computers, Environment and Urban Systems, 31, 188-205. Fang, S., Gertner, G. Z., Sun, Z., & Anderson, A. A. (2005). The Impact of Interactions in Spatial Simulation of the Dynamics of Urban Sprawl. Landscape and Urban Planning. Forman, R. T. T. (1995). Land Mosaics: The Ecology of Landscapes and Regions. Cambridge Univ. Press: Cambridge. Harvey, R.O. & Clark, W.A.V. (1965). The Nature of Economics and Urban Sprawl, Land Economics, XLI (1), 1 – 9. Hu, Z. & Lo, C.P. (2007). Modeling Urban Growth in Atlanta Using Logistic Regression. Computers, Environment and Urban Systems, 31(6), 6. Huang, B., Zhang, L. & Wu, B. (2009) .Spatiotemporal Analysis of Rural-urban Land Conversion. International Journal of Geographic Information Science, 23(3), 379-398. Long, Y., Mao, Q. & Dang, A. (2009). Beijing Urban Development Model: Urban Growth Analysis and Simulation, Tsinghua. Science and Ecology, 14(6), 782-794. Luo, J. & Wei, Y.H.D. (2009). Modeling Spatial Variations of Urban Growth Patterns in Chinese Cities: The Case of Nanjing. Landscape and Urban Planning, 91(2), 51-64. Mubareka, S., Koomen, E., Estreguil, C. & Lavalle, C. (2011). Development of a Composite Index of Urban Compactness for Land Use Modelling Applications. Landscape and Urban Planning, 103, 303–317. Poelmans, L. & VanRompaey, A. (2009). Complexity and Performance of Urban Expansion Models. Computers. Environment and Urban Systems, 34(1), 17-27. Shamsuddin, S. & Yaakup, A. (2007). Predicting and Simulating Future Land Use Pattern: A Case Study of Seremban District. Journal Alam Bina, 9, 1. Shen, T.Y., Wang, W.D., Hou, M., Guo, Z.C., Xue, L. & Yang, K.Z. (2008). Study on Spatio-temporal System Dynamic Models of Urban Growth. System Engineering Theories and Practices, 27(1), 10-17. Tarh & Amayesh Consulting Engineers. (2010). Revised Master Plan of Urmia. The West Azarbaijan Organization of Housing & Urban Developement. United Nations. (2011).World Urbanization Prospects: The 2011 Revision. Verburg, P.H., Schot, P., Dijst, M. & Veldkamp, A. (2004). Land use Changemodelling: Current Practice and Research Priorities. Geo journal, 61, 309–324. White, R. & Engelen, G. (2000). High-Resolution Integrated Modeling of the Spatial Dynamics of Urban and Regional Systems. Computers, Environment and Urban Systems, 24(5), 383-400. Wilson, E., Hurd, J., Civco, D., Prisloe, M. & Arnold, C. (2003). Development of a Geospatial Model to Quantify, Describe and Map Urban Growth. Remote Sensing of Environment, 86, 275–285. Wu, F. (2000). A Parameterized Urban Cellular Model Combining Spontaneous and Self- Organizing Growth in GIS and Geo-computation (Innovations in GIS 7). (pp.73-86). In Atkinson, P and Martin, D (Eds). New York: Taylor & Francis. Wu, F. (2002). Calibration of Stochastic Cellular Automata: The Application to Rural-urban Land Conversions, International Journal of Geographical Information Science, 16(8), 795-818. Xiaoping, L. & Xia, L. (2008). Simulating Complex Urban Development Using Kernel-based Non-linear Cellular Automata. Ecological Modelling, 211(1-2), 169-181. Xie, C., Huang, B., Claramunt, C. & Chandramouli, C. (2009). Spatial Logistic Regression and GIS to Model Rural-urban Land Conversion. International Journal of Geographic Information Science, 23, 3. Yeh, A.G. & Li, X. (2001). A Constrained CA Model for the Simulation and Planning of Sustainable Urban Forms by Using GIS. Environment and Planning B: Planning and Design, 28, 733–753. Zeng, Y.N., Wua, G.P., Zhanb, F.B. & Zhanga ,H.H. Spatial Land Use Pattern Using Auto Logistic Regression, A School of Info-physics and Geomatics Engineering, Central South University, Changsha, China.